The choir was formed by the then parish priest of Naxxar, Rev Paul Caruana in 1974 as a girls’ choir and sang for the first time at Christmas that same year. In the following months male voices were added and the enlarged choir sang for the first time in the Good Friday celebrations of 1975. Eventually adult female voices were added and the choir became an SATB choir. The first big occasion for the choir came in 1980 when the members took part in the monumental mass composed by Joseph Fenech. Having passed that test the choir moved ahead. 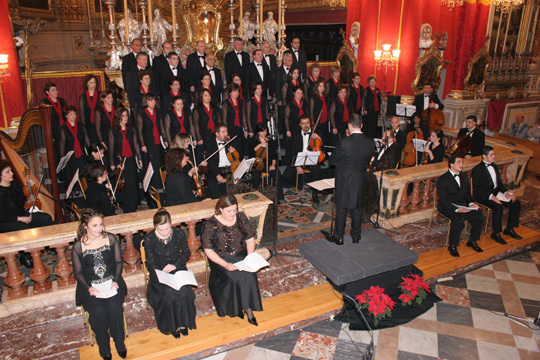 Not only did the choir perform regularly in the liturgical feasts in the parish church at Christmas time, Good Friday and Easter as well as the parish feast – the Nativity of Our Lady – but the choir was also invited to take part at the Manoel Theatre for a number of years during the operetta season. The Jubilate Deo Choir took part in the BBC production “Songs of Praise” which was televised worldwide and was also one of the choirs that sang during the papal mass during the pope’s visit to Malta. Throughout the years the choir was also led by Rev Richard Borg, Rev Rene Vella assisted by Lawrence Scicluna. In June 2004 the choir was entrusted to Christopher Muscat. Since then, the choir has embarked on a number of ambitious projects (seminars on vocal and choral technique and the setting up of the choir’s own official website) as well as a number of extremely successful concerts (amongst others the Christmas Concert marking the choir’s 30th Anniversary in 2004 and the 2005 Christmas Concert in which the choir performed the first Malta performance of Camille Saint-Saens’ Oratorio di Natale amongst others).